We probably should have seen this coming, what with the summer blockbuster Green Lantern in theaters this summer. Sony Online Entertainment just held its annual Fan Faire, where it revealed that the very first download pack for the PC and PlayStation 3 MMO DC Universe Online will revolve around Hal Jordan and the exploits of both the Green Lantern Corps and the antagonistic Sinestro Corp.
Players will have the opportunity to join either side and do battle using an entirely new power set and particle-based weapons. The story frames the increased number of Light Power-wielders as Reservist Lanterns called to duty as a result of the main game’s central villain, Brainiac. 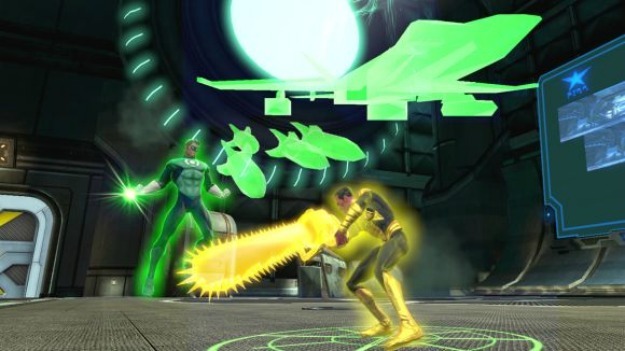 The powers — green for Lanterns and yellow for Sinestro flunkies — are combo-based and work best as chained attacks; there are 48 individual light abilities in all. The expansion will also introduce three new locations into the game. It sounds like S.T.A.R. Labs is the story’s locus point, at least with regards to the main game; here, Brainiac is stealing power and players will team up with Hal Jordan and Sinestro to stop him. You’ll also be able to visit Coast City, where you’ll encounter and do battle with members of the Red Lantern Corps, including Atrocitus. Finally there’s Oa, the planet which serves as the headquarters for the Green Lantern Corps. The story involves a prison breakout which you can work to either stop (as a hero) or incite (as a villain), helping Sinestro to free Lyssa Drak in the latter scenario. The DLC pack will be on display at San Diego Comic-Con next week, in advance of a planned summer 2011 release that carries a cost of $9.99.